The Super Savonia is designed for big saunas. It is suitable for apartment buildings, hotels, holiday resorts, indoor swimming pools, fitness centers, and other commercial facilities. It has adjustable legs that stand on the floor. It is operated with a separate control control panel. All metal parts of the heater are stainless steel. It has a very durable structure and it consists of nine heating elements. With a stone capacity of around 75 kg, Super Savonia generates long-lasting steam. 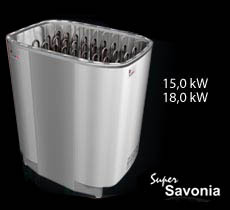 Super Savonia is available in 15,0 kW and 18,0 kW.